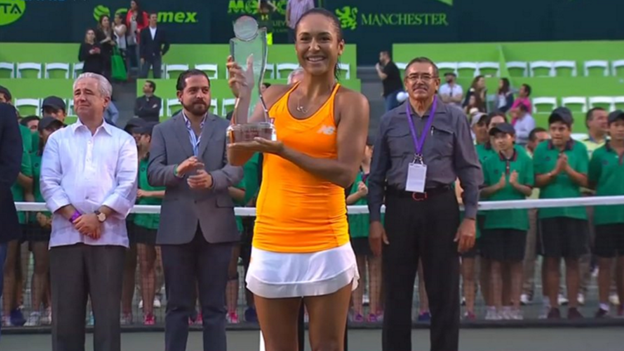 British number two Heather Watson beat Kirsten Flipkens to win the Monterrey Open in Mexico, her third WTA title. The 23-year-old lost the first set but came back to defeat her 30-year-old Belgian opponent 3-6 6-2 6-3. World number 73 Flipkens briefly threatened a revival in the deciding set, forcing two break points as Watson served for the match. But the world number 84 held her nerve to add the title to the Japan Open in 2012 and Hobart International in 2015. "It was really tough, I was so nervous coming into the match because I'd never beaten Kirsten before, she's a great player and really makes you work," Guernsey-born Watson said. "I thought she was pretty flawless in the first set and I was getting frustrated but I just had to stay clam and try my best, and didn't look past the next point." On the way to the final, Watson beat former world number one Caroline Wozniacki in the last eight, where British number one Johanna Konta lost to Flipkens. "Watson won her third WTA title without the benefit of a coach (other than her mum, who came onto court to give her a pep talk during the first set of the final). "She was working with Pat Harrison while training at the IMG (Bollettieri) Academy in Florida before travelling to Mexico, but has been without a full-time coach since splitting with Diego Veronelli at the end of last year. "She is projected to rise to 53 in the rankings, and now heads to Indian Wells. Her ranking had been too low to gain direct entry, but she was granted a wildcard having reached the fourth round last year."